SUPER HIT: Cheap flights to USA: New York for €265! Virgin Atlantic and British Airways reintroduce famous promo tariff which allows you to book cheap flights to USA. Multicity flights Warsaw – New York – Manchester are available for only €! This list is sorted by price, from cheapest to more expensive departure places. 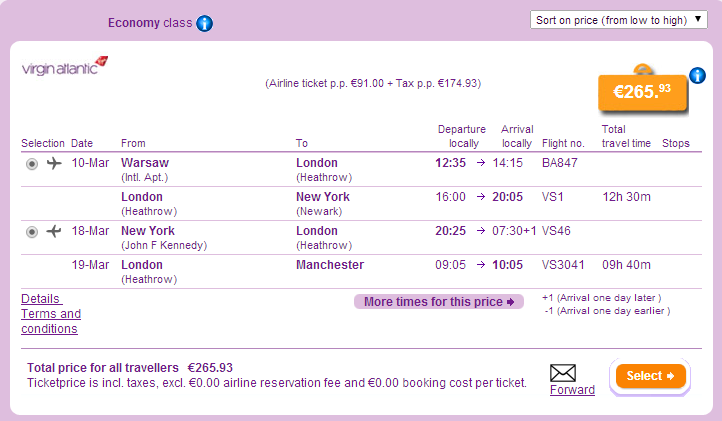 Return is always to Manchester or you can fly back to Edinburgh for the same price. Travel dates are until 22nd June 2014 and there is no maximum stay which makes this offer perfect for Summer trips to USA or Work and Travel programme. « Cheap flights to India: Mumbai for only €397!